Buffy is one of my Level 2 student's here in Melbourne, Florida. 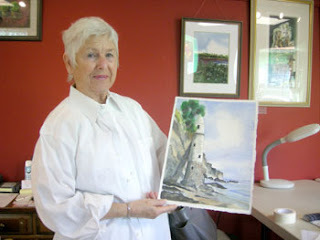 I wanted to show off one of the paintings she brought in. I think she did a wonderful job. She is working hard to implement the techniques we are working on in class. I think she is mastering the washes beautifully, and I really think her composition is a nice one! Looks like a great painting, too bad I can't make it bigger to see more detail. You're looking good. Love You!! Who is this "Buffy"? She appears to be not only beautiful, but an amazing artist! Hmmmm....a newfound talent in the art world!